Using an ultra-high-intensity laser beam and a two-mile-long particle accelerator—it could be possible to create something out of nothing, according to University of Michigan researchers who developed new equations that show how a high-energy electron beam combined with an intense laser pulse could rip apart a vacuum into its fundamental matter and antimatter components, and set off a cascade of events that generates additional pairs of particles and antiparticles. “We can now calculate how, from a single electron, several hundred particles can be produced. We believe this happens in nature near pulsars (image) and neutron stars,” said Igor Sokolov, with the Space Physics Research Laboratory in the Department of Atmospheric, Oceanic and Space Sciences who conducted this research along with associate research scientist John Nees, emeritus electrical engineering professor Gerard Mourou and their colleagues in France. 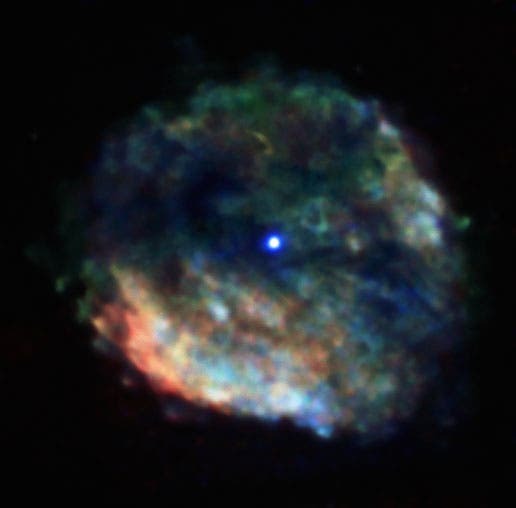 In Chandra's image (above), the colors of red, green, and blue are mapped to low, medium, and high-energy X-rays. At the center, the bright blue dot is likely the neutron star that astronomers believe formed when the star exploded. For several years astronomers have struggled to understand the behavior of the this object, which exhibits unusually large variations in its X-ray emission over a period of years. Astronomer's at the Harvard X-Ray Telescope took the image showing the 2,000 year-old-remnant of such a cosmic explosion, known as RCW 103, which occurred about 10,000 light years from Earth. “It is better to say, following theoretical physicist Paul Dirac, that a vacuum, or nothing, is the combination of matter and antimatter—particles and antiparticles.Their density is tremendous, but we cannot perceive any of them because their observable effects entirely cancel each other out,” Sokolov added. Matter and antimatter destroy each other when they come into contact under normal conditions. An experiment in the late ’90s managed to generate from a vacuum gamma photons and an occasional electron-positron pair. These new University of Michigan equations take this work a step farther to model how a strong laser field could promote the creation of more particles than were initially injected into an experiment through a particle accelerator. The researchers have developed a tool to put their equations into practice in the future on a very small scale using the HERCULES laser at U-M. To test their theory’s full potential, a HERCULES-type laser would have to be built at a particle accelerator such as the SLAC National Accelerator Laboratory at Stanford University, which is not currently planned.